We considered using “green” materials when it was a viable and affordable option. 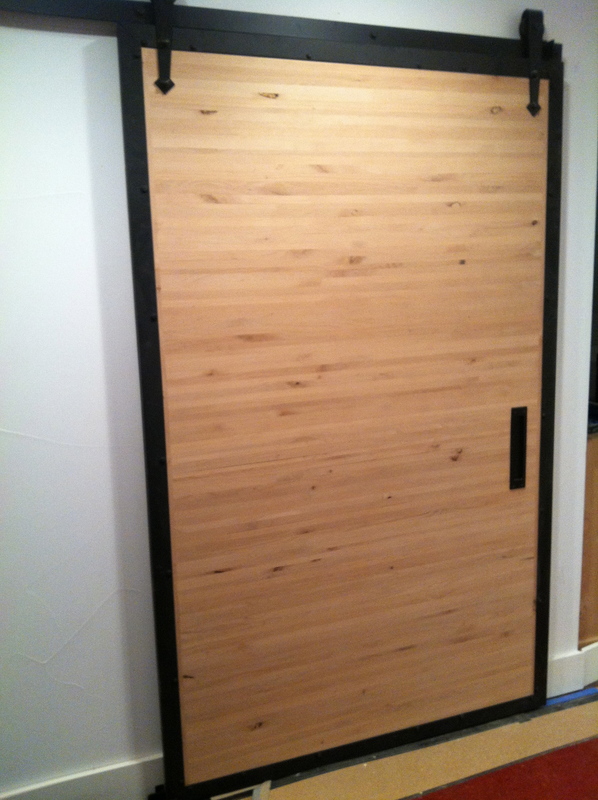 We selected this sliding door because it is made from scrap alder wood. The contractor added the metal frame to make it more sturdy. It also adds more character. The crew was busy last week! Countertops were installed, including the granite countertop for the island. We went for the induction cook top and are now shopping for new stainless steal cookware. The oven is just below the cooktop. The microwave is a slide drawer type on the other side of the island. The guest bathroom is also taking shape, with tile, tub, sink and wall-mounted toilet now up. We had saved the faucet from the old place, thinking we could save ourselves the expense of buying a new one. The contractor now can’t find it, so it looks like we’ll be buying one after all. With so little storage space in the condo, we are looking to make storage when we can. Rather than just a post that covers a structural pole, we now have bookshelves. On the other side of the half-wall will be our office. That’s downsizing from a full room that served as our office. We got back from Ireland and there had been progress made on the condo, but it’s not done. We were able to arrange to stay longer in the apartment, thankfully! Jim and I had planned a trip to Ireland some time ago, thinking that surely, the condo would be done by now. But we leave this Wednesday and there is still a lot to be done. Tony, our contractor, claims that when we return, the condo will be ready for us to move in. I think he may be calling in a team of fairies while we are away. 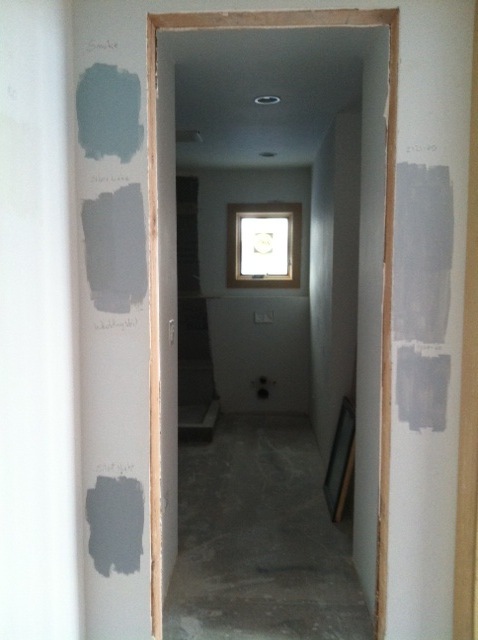 We decided to go with the white doors and trim, then paint the hallway a light gray. We went with a color called White Water. We do have a water theme going on here, so that sure sounds like a good name. But I do wonder, how do they come up with those paint color names?